Many of my poems show up as whispers of ideas. Maybe one line or two that reveal themselves…suddenly, from out of nowhere. That’s the most exciting part—that magic! Then…what comes next? where will that whisper lead me? To your question, what I enjoy most is allowing the poem to show up and become what it needs to become, allowing myself to be open to the creative spirit so I can tell the story. One of my favorite poems in the new book is called “Microcosm.” It’s about two separate encounters, one with a spider on my desk, and one with a fish by a pond—and me, wondering what they might be thinking about as we crossed paths. You know, in that same way you wonder about the lives of people in the lit-up rooms of houses you drive by at night? peering as if to say Who Are YOU? Perhaps the same look of WHAT? and WHEN did I learn to fly? Another favorite is “I Am Just the World.” It was one of those poems that just showed up, as I was saying before. I was walking on my favorite trail in the woods, and heard the something crawling. I followed the sound and found a spotted turtle making its way through the fall leaves. Spotted turtles are listed as a species of concern/endangered, so this was a very special sighting. And poignant. I’ll step aside for you. I think some people take offense that I anthropomorphize the creatures I meet in the woods – give them personalities and narratives. But, it’s not like I think they are skipping around in the forest singing and such. I use personification to get the reader to think outside of themselves, to consider the other creatures with whom we share this planet. 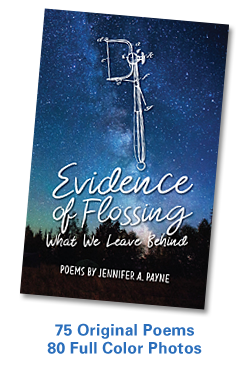 We’re all connected…that is, ultimately, the theme of Evidence of Flossing: What We Leave Behind, and of a lot of my other writing. I write mostly free form poetry. It’s simply how my muse speaks to me right now. However, I have been working with a group of local poets, the Guilford Poets Guild, for the past few years. Very often they write in specific forms— a sonnet, a villanelle, haiku. I’ve been thinking I’d like to challenge myself to look to form a little more in my work. That could be fun! For the near future, I’ve been thinking about publishing a short story I wrote called “Water Under the Bridge.” It’s an epistolary novella told through a series of emails. And then another book of poetry, but that won’t be for several years. I’ve been a writer for as long as I can remember — grade school creative writing, high school newspaper, college journalism, freelance writing, zine publishing. For the past 25 years, I’ve been the wearer of all hats – editor, copy writer, marketing wordsmith – as the owner of Words by Jen, a graphic design business in Branford, Connecticut. I maintain a regular blog, Random Acts of Writing (www.randomactsofwriting.net) on which I write essays, travelogues, book reviews, flash fiction, and poetry. I have written poetry for much of my life, but have gravitated to that form almost exclusively for the past three or four years. Better to just make time to do the writing, perfect your craft, connect with other writers. Just write. I do my best writing at 3:00 a.m. I love the quiet of the early hours of the morning, before anyone else is awake. There are no distractions – none of the bells and dings and buzzing of our social technologies. Just sweet dark quiet…and coffee. Honestly? I wanted to be Jeannie from I Dream of Jeannie. I loved her little bottle house! Wouldn’t that be a great place to write? Plus, she had magical powers. What could be better than that? Thanks for being here today, Jen. Thank you, Lisa, for this chance to talk with you and your readers about writing and my new book! This entry was posted in Books, Creativity, Ecospirituality, Photography, Poetry, Publishing, Spirituality, Writing and tagged Book, Books, Branford, Connecticut, Cosmology, Creativity, Ecospirituality, Jen Payne, Mindfulness, Nature, Photography, Poetry, Spiritual Ecology, Spirituality, Storytelling, Writing. Bookmark the permalink.